This is a pretty white button badge with pink hearts & Mother of the Bride written in the middle. These make such sweet Hen Party or Wedding Day badges and they let everyone know who is who & is a lovely keepsake for after the big day. We have other badges in this design, so check out the rest of the wedding category and get matching badges for everyone in your wedding party. 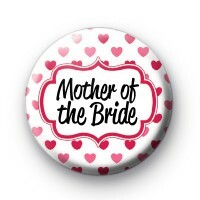 Most of our wedding badges can be customised with your own names and dates at no extra cost. Standard 25mm badge handmade in the UK.